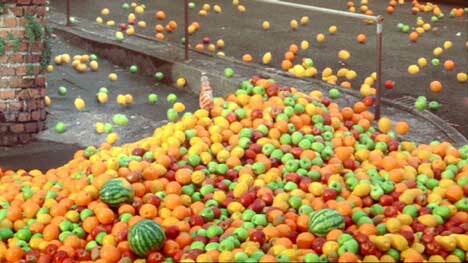 Tango Clear, the clear fruit juice product released by Britvic in 2005, was promoted in “Tango Bravo”, a spoof of the Sony Bravia Balls campaign. 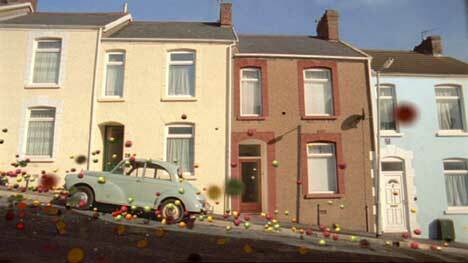 Instead of sending coloured balls down a street in San Francisco, advertising ageny Clemmow Hornby Inge (CHI Advertising) arranged for oranges, apples, lemons and melons to be sent down a street in Swansea, Wales. 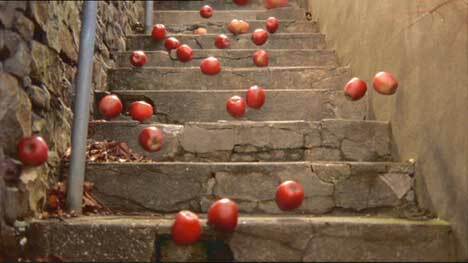 The spoof included many elements from the original, including the Jose Gonzalez soundtrack and the sequence of shots. There were subtle differences though. Fruit is shown going through a window. We’re given a shot of a melon mashed on the windscreen of a car. Flower pots fall to the ground. Instead of a frog appearing from a downpipe, the Bravo ad featured the appearance of a toad. The Tango Bravo ad was released virally with the help of a web site formed by the fictional Swansea North Residents Association. The local action group was protesting against the damage caused by the Tango film crew, complaining that no-one had informed them about the filming. Nor had anyone cleaned up afterwards. Locals posted photographs of the damage on the international communal photography site, Flickr, and auctioned broken items, such as garden gnomes, on eBay. In reality, of course, the film crew had covered their bases. The Swansea locals were included. The fruit was in fact gathered up and donated to a local animal sanctuary. After just one day of the viral release the site had received almost 200,000 hits. PSP and iPod versions were made available at the Swansea site and at Google Video. The campaign spread to YouTube, BoreMe, Kontraband. Finally the Tango Bravo spot made its way to television, due to its online popularity. The Tango Bravo campaign was developed at Clemmow Hornby Inge by creative director Ewan Patterson, art director/copywriter Micky Tudor and agency producer Anthony Falco. Filming was directed by Jim Gilchrist at Thomas Thomas Films, with producer Billy Jones. Editor for Tango Bravo was Amanda Perry at Peep Show, London. 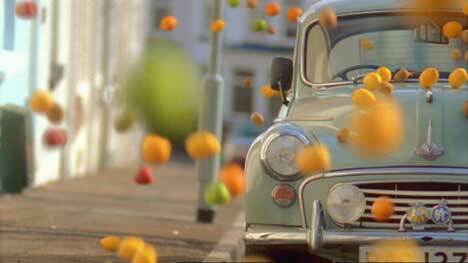 Post production was done at The Mill, London, who had done much of the work for the original Sony Bravia Balls campaign. Mill staff included producer Gemma Smith, telecine artist Paul Harrison, lead Flame Ant Walsham, 3D producer Gil Games, and 3D artist Andrew Proctor. Music was licensed through Rapid Records, Peace Frog. Sound was produced at Scramble. Media placement was arranged by Mindshare. The Tango Bravo campaign has won a number of awards, including a silver Lion at the Cannes International Advertising Festival in June 2006, a silver at the Irish Shark awards, and a silver in the Epica Awards.